Bookmark set of 25 to use as a gift or a teaching resource for church family and friends. Popular tree motif with the Old Testament Names of God: Adonai, Elohim, El Elyon, El Shaddai, Yahweh, Jehovah Jireh, Jehovah Rophe, Jehovah Nissi, Jehovah Mekadeash, Jehovah Shalom, Jehovah Tsidkenu, Jehovah Rohi, Jehovah Shammah. 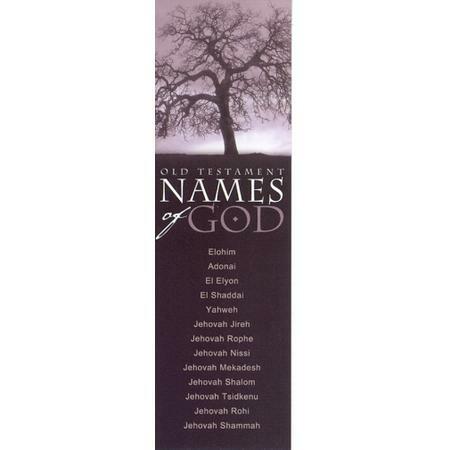 Expanded biblical references for the names are displayed on the reverse side. Contemporary sepia color scheme; package of 25; 2" x 6.5"; cardstock.